This spectacular stand alone home completed in 2009 is great for larger groups and has a location that is enviable. It is 5100 square feet of pure luxury that will be the perfect location for your next vacation! 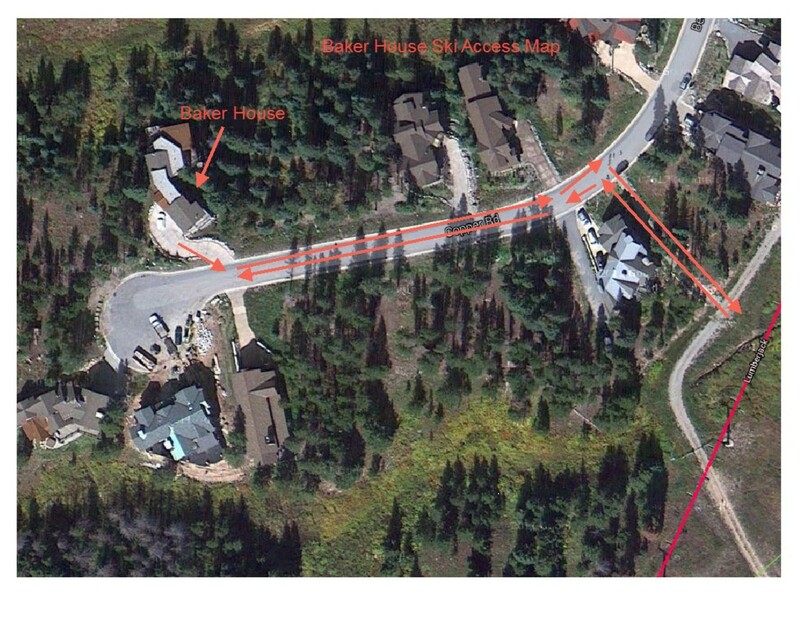 This home is located in Lewis Ranch subdivision of Copper Mountain; an exclusive gated community. Out the back door you have access to some of the best cross country and snowshoeing in the National Forest; out the front door with a 50-yard walk is the Roundabout Run that is a green run just above the Lumberjack Lift! Groups renting this property do have access to a free, on call shuttle, that will come right to your front door and take you anywhere in Copper Mountain (shuttle is only available during prime dates so please check with your reservation specialist about availability). Call for more details or to reserve this property! Arrived on 2019-03-17 | Allison L.
Wonderful house! The bedroom layout was perfect for our group and the kitchen was wonderful and so well stocked! Would definitely stay here again! Arrived on 2019-03-02 | Curtis K.
We thoroughly enjoyed our stay in this spectacular home at Copper Mtn. The home is tastefully decorated and the views were amazing of snow laden trees through the large, floor to ceiling windows. The kitchen is well stocked and we loved cooking on the gas cooktop. The large, gas fireplace was a real bonus on snowy days and created a cozy atmosphere. Using the dial-a-ride Copper Coach (shuttle) made getting to the ski slopes easy. We did lose power one evening (for a couple of hours) and could not find any candles or flashlights at the house so I would recommend to the management company that they provide these, just in case something like this happens again. I also let the management company know that the bed in the master bedroom needs replacing. We would not hesitate to stay here again on a future ski trip as this lovely home worked out perfectly for our group of 10 adults. The property was fantastic for the families. Arrived on 2019-02-14 | Thomas A. Enjoyed the open floor plan from the kitchen to the dining room and to the living room. We were on the slopes in the AM and cooked dinner every night at the house. WE WILL BE COMING BACK! Arrived on 2018-12-26 | Roland B. The home is absolutely gorgeous! The location is superb! The kitchen is huge which is a plus for a large family! We had a wonderful stay at the baker house. The house had a gorgeous view of the snow capped mountains. We were a group of six families and had plenty of space for everyone. The property company was professional and even sent maintenance help when we were unable to figure out the thermostat in the rooms.the house was truly a home away from home. We had a quick outing with our church leadership team (2 days). This beautiful home helped to create the atmosphere of warmth, serenity and friendliness. Not just because of so many extras it offers but also because of its location overseeing mountain hill and being kind of secluded from other villas in the neighborhood. We found it in spotless condition, all the details were carefully thought through. We would definitely love to come back. We needed a place for a family reunion that would allow each of 4 families private space and have gathering areas where we could spend time together. This house was simply amazing! It went beyond our expectations! The views were fabulous. The design was creative. The quality was outstanding. Would love to come again! Theres plenty to do like hiking, touring the towns that are near Copper Mountain, horse back riding, and just relaxing and taking in the beautiful scenery. The house was well acquitted with anything you needed. Beautiful house, great furnishings, we were not prepared for so many levels, but each room had privacy we appreciated. Main draw back was that it is not ski in-ski out. Had a really great time with my extended family in this spacious and accommodating house. Super close to trails and beautiful house and views. We just got back from a week long stay and we had a marvelous time. The house was out of a magazine with all the amenities (except an ice machine). We had all our children and grandchildren and everybody had a place to go! The shuttle worked really well. There are many flights of stairs in this house so that may be a problem for some people but the living area is huge and the views are fabulous! Some guys I work with and I, rented the Baker house for a couple days to work and have some team building. From all of us, what a tremendous house. Beautiful setting, great access to the slope and beautifully appointed. We enjoyed relaxing with a couple games of pool in the evenings and just hanging out watching basketball in the living room. For the 5 of us, instead of cramped hotel rooms, it was great catching up over some breakfast, knocking out some work, and then sliding down the hill. Thanks for a great experience. Arrived on 2017-12-27 | Carlos P.
The house was stunning. Everything was clean and in perfect conditions. We enjoy the convenience of the ski in/ski out. The area is beautiful. We will love to comeback it was an amazing experience. Arrived on 2017-08-04 | Maria S.
The house is beautiful and plenty of room for 12 people . Arrived on 2017-07-10 | Karl M.
Our family came together to celebrate our 50th Wedding Anniversary. This was the perfect home to accommodate us all. It is spacious, clean, and has every comfort. The views, spectacular! The management surprised us with a bottle of champagne for our celebration and checked with us in case we needed anything. Perfect location for activities for all ages. We'd definitely recommend the Baker House for your next mountain holiday! The house is so very beautiful . Arrived on 2017-06-08 | Erica M.
We went for a girls weekend for the mud run in cooper and stayed at this house was so great everyone had a master room and plenty of room ! Would love to stay here again! Incredible house with everything needed! Arrived on 2017-03-27 | Martin D.
For those used to space and luxury this home will not disappoint. Only drawback is lots of stairs but don't let that deter you. The home is gorgeous, extremely clean, and perfect for any family. We shared the Baker House in January with 2 other families and cannot say enough nice things, it was an amazing vacation! The house offers ultimate privacy with its multi-level layout, giving each couple their own suite and the kids their own complete level. The amenities, with multiple washer/dryers, state-of-the-art kitchen, heated garage and driveway, hot tub, and stunning views all around left nothing lacking. River Ridge Rentals was proactively ensuring our stay was enjoyable and the private shuttle for Lewis Ranch was easy to book and always immediately available. Parents and kids are all in agreement that we will definitely return!! Thank you so much for staying with River Ridge Rentals at Baker House! We appreciate your business and look forward to seeing you again. We are so pleased you enjoyed your stay and let us know anytime we can be of any assistance. Arrived on 2016-09-14 | Carol L.
The Baker house exceeded our expectations for a friends reunion, 5 couples attending. Plenty of space, a fantastic kitchen for a group of cooks, a bed and bath for all, and the house was immaculate. Great fall color in the area was an added perk. Thanks for a lovely stay! Arrived on 2016-04-13 | David N.
Arrived on 2015-07-10 | Brett W.
This house is amazing and perfect for families. The pictures and description don't do it justice. The people at River Ridge Rentals were great to deal with. If your trip is taking you anywhere in Summit County, then this is the house for you. Wonderful House with a Great Management Company! Our family of 9 stayed in this house for a week in July and loved our experience. Everything was first class. Of all the rental properties in which we have stayed, we have never enjoyed a better managed property. The Baker House was very well appointed and River Ridge Rentals, the management company, had it completely stocked with paper products, shampoos, soaps, etc. The few questions or concerns we had were addressed immediately by competent staff. We would definitely rent this property again or any one managed by River Ridge. We just returned from our annual ski trip to Copper Mountain. This year we chose to stay in the Baker House at Lewis Ranch. This place was amazing. Everything was clean and well managed. Did have a couple issues but management resolved the problems in a timely manor. Nothing out of the ordinary, we just didn't want to get blamed for the problem. We had 5 families staying for 5 days in this house and still had plenty of room. The village shuttle was very helpful too.